The Metals Manufacturing Program prepares students for employment or post secondary education in metals production occupations. Through application of metal working skills, students learn the manufacturing process. Production work in the program is designed to teach skills in teamwork, problem solving, and human relations. 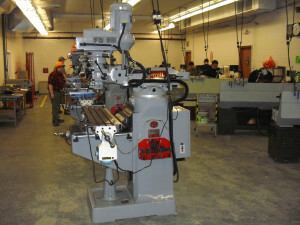 Activities include: blueprint reading, Computer Assisted Drawing (CAD), precision layout and measurement, and the introduction and safe operation of various metal working equipment including grinders, band saws, drill presses, lathes, vertical mill, Computer Numerical Control (CNC) milling center. Students are exposed to and learn some basic welding and cutting operations. Outcomes: Competency certificate, Skill Profile, MaineOxy safety certificate, and NOCTI certificate.